Melbourne Geek Night – Maker culture and everyone. In March 2015, Gil was invited by Melbourne geek night to talk about the process of making, makers, and maker culture. The presentation was delivered to Melbourne’s tech savvy, and Gil was surprised at how this concept was not known about the maker community at large. This was an amazing opportunity to share what I love doing and what we have been steadily working on at Melbourne Library Service. 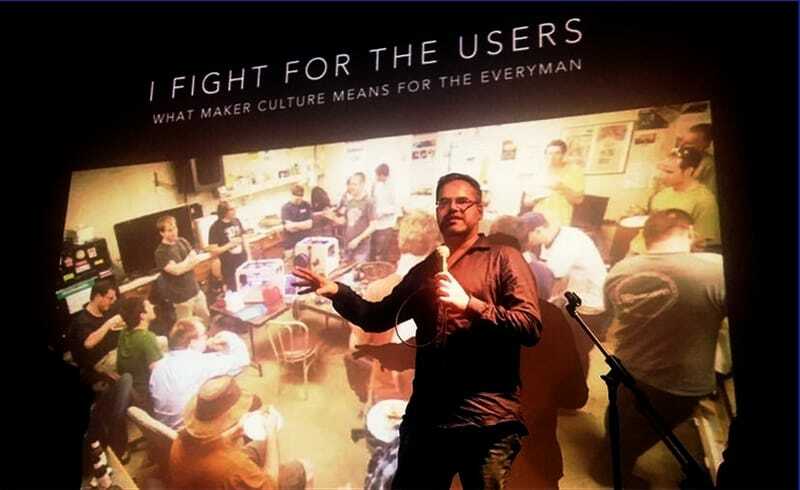 The talk titled “I fight for the users – what maker culture means to the Everyman” was a short rundown of the potential for making and it’s impact on education and manufacturing within Australia’s ecosystem. I was greeted by positive response after the talk, and the amazing conversation that was generated based on what I presented. What was very clear after this experience is that make a culture in Australia is just on the verge of breaking. Most people do not know or understand the potential of this incredibly new and exciting model for innovation. It will only be a matter of time when makerspaces and make a culture will be incorporated into big business and main screen education. This presentation was a joy to give and I look forward to presenting with Melbourne big night in the new future.